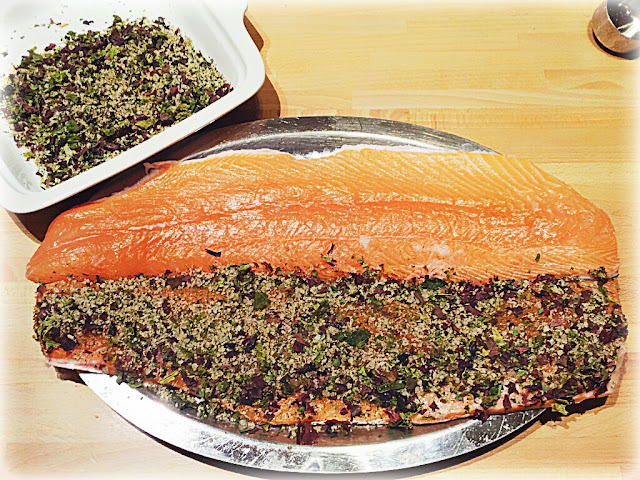 A Normandy Kitchen: Gravlax and a Merry Christmas! Happy Christmas to you too Ivan, enjoy your break. Your fire/chocolates/book/dog combo sounds pretty wonderful, I have to say! Thank you - Merry Christmas to you! Thank you for sharing your blog, your home, recipes, etc. I have enjoyed reading them very much throughout the season. Have a very Merry Christmas and a wonderful New Year! Thank you, really sweet of you to say and it is my pleasure! Awesome recipe, love the doggie treat post too! I have actually made the pork and puff pastry bites from your previous post for tonight! Just stopping by to wish you all a very Merry Christmas from our family to yours! Merry Christmas to you all and happy you made the food - hope you liked it! Best wishes Ivan and a woof from Aston! All the best Ivan! We are having Tourtiere on Boxing Day and that salmon looks delicious! See you soon. Merry Christmas and best wishes from us three to you three! All the best Ivan, Mark and Aston....Sophie just came in from a snow romp...guess what? She is covered in snow....she loves this season. Happy New Year! Sounds lovely Christmas hope you have a lovely day. Thank you, yes - a relaxed and too much food sort of time (perfect!). I hope you also had a wonderful time. Your fish looks delicious, but I'll have to wait for a trip to Nova Scotia to get some fresh fish from the wharf in Digby. I hope your French dulse tastes better than Nova Scotian! It always seemed that the more I chewed it, the bigger and worse it got! Maybe it's your Cordon Blue touch! I hope your pug enjoyed his homemade doggie treats! The fresh bit is important and I bet the salmon is wonderful from those parts! The dulse I use is small, dried and shredded - so not like the fresh dulse which sounds like an acquired taste! I just use it for the 'sea' taste and it is removed before slicing. Aston (Mr.pug-head) loved his biscuits and was staring intently at the box I had put them in, so I had to hid it! !